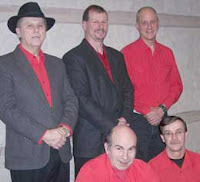 The well known Country Grass band will be playing at the Clifton Opera House on Friday, August 5th at 7:30pm. This band has been playing together since 1971, and has appeared at the Opera House on numerous occasions. It will be a great night of traditional and modern bluegrass. The band members are founder Wayne Horsely, lead singer, lead and rhythm guitarist and songwriter. Tom Patrick is the band's bass picker and is one of the finest you will ever hear. Joe Bowsman supplies the tenor and lead vocals, along with a solid mandolin chop and lead. Bottom row from left, Johnny Walker is an accomplished dobroist and furnishes the baritone lines as well as lead vocals. Bob Stacy, on banjo. The A/C is on and the building is cool for this hot bluegrass group. Box office opens at 6:30pm, suggested door donation $7.00. The opera house is located at 5 So. Clay Street, Clifton.